In an highly touristic area of 4 stars Hotels (main entrance few steps from top Spa Resorts in Recanati Giardini Naxos) very nice, spacious and fully equipped apartment on a small block of flats surrounded by a lovely garden. The flat is provided with free Internet WiFi, has a private garage on the basement for 2 cars and the residence has a secondary gate leading directly to the beach (100m away). The area is plenty of facilities for children, restaurants, shops, clubs, piano bars and supermarkets. It offers also the unique opportunity to be easily reached without car by bus (the Recanati bus terminal is just in front of the building). Frequent buses are available to Taormina center, Etna, Catania, Messina, Siracusa, Aeolian Islands and hourly trips connect the flat to the Catania Fontanarossa airport. I am Andrea and I live and work in Luxembourg. I am the son of the owners of this apartment. My father is a retired lawyer and my mother, Angela, worked as a school teacher. I grew up in Sicily and love it. I often spend My holidays in the Etna neighborhood. The apartment is located in Recanati, Giardini Naxos, in a strategic position overlooking the Ionian Riviera. Attached to the sea, it is very well connected to Taormina's village, Messina, Catania, Siracusa, for Etna's tours and with the Fontanarossa airport. It is one of the most exclusive places in Sicily representing the heart of the island’s tourist trade. It offers luxury, romance, comfort, warm Mediterranean hospitality and stunning views. The glamorous town of Taormina beckons from the hills above, Volcano Etna looms to the south, and views of the Catania and Calabria coastlines surround the sea side. Bathroom with shower, WC, bidet, hair dryer. Secure, private garage for two cars is available in the building. Windows opening on to balcony with views of garden, 1 double sofa bed. Flat and digital TV. Dining table that seats five. Modern kitchen with the latest available technologies (Whirpool, Smeg): electric stovetop, dishwasher, grand fridge and freezer. Microwave, kettle provided with ample shelves and cupboards. Crockery and cutlery included. The first golf course developed in Sicily in 1989 (“Il Picciolo Golf Club”, Castiglione di Sicilia) is far only 30 minutes by car, about 21 Km from the flat. Notes on accommodation: Electricity and gas are included. Secure, private garage for two cars is available in the building. Outside: Balcony with outside dining table and chairs. Building entrance with garden. Top floor with common terrace and views of the seaside and Etna. Utility Room: Washing machine, iron and ironing board, sun lounger. Cleaning / Towels / Linen / Maid service: The house will be clean on arrival and will be cleaned on departure. Towels, linen and beach towels are provided. We were met by Andrea at the airport and he brought us to the apartment. A lovely welcome with a good explanation on how things worked and the apartment layout. The apartment is a good space with 2 separate seating areas and a balcony that catches the sun all day. Ideally located for a 3 minute walk to the beach and good restaurants around the apartment. Also an easy 10-15 min walk into Giardini where there are lots of restaurants and other beaches as well. Giardini is well positioned to travel up and down the coast with Taormina only 25 minutes away by bus. A great stay, and Andrea was most helpful in finding me an excursion to Mount Etna. Smart apartment in a great location. We stayed for a week in July/Aug 2016. 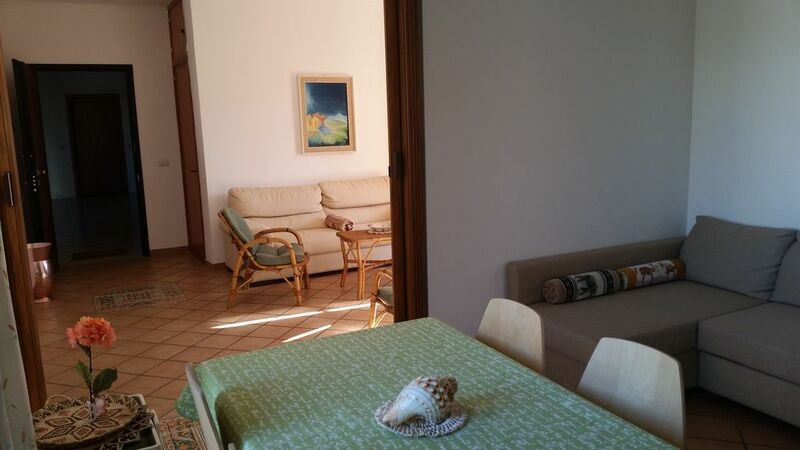 The apartment is very spacious, clean, and in a great location for the many restaurants in Giardini Naxos. Recanati beach is about 100 metres away, and has multiple "lidos" (where you can hire sunbeds/parasols and use the cafe/bar), or use the free areas of beach as we did, as Andrea supplies beach towels in the apartment. The Recanati bus terminal is about the same distance away - this is great for buses to/from Catania Airport (half hourly in the morning, then hourly for the rest of the day). There are also buses to many other destinations (Taormina was 13 Euros return for 4 of us). All in all a great value apartment! Very spacious and clean apartment excellently located for the beach as well as for visiting other areas of interest. A warm welcome by Andrea to settle us in with good advise on attractions and moving around . The apartment is home from home as it is well furnished. This was one of the best apartment we ever stayed in! Very compfortable and clean, good location, near the beach. In the apartment theres was everithing you`ll need! Thank you again Andrea! We stayed for a week at Easter. The apartment was clean and had everything you could need for a week away. The owners gave us some freshly picked lemons and a bowl of chocolate eggs. There are some really nice restaurants on the same road who were all extremely friendly and welcoming. If you turn right out of the apartment and keep walking, you can get to Giardini Naxos in about 10 mins and are on the marina - really lovely town. We loved it - I would say a week is not long enough ! We enjoyed this part of Sicily very much. The apartment was very spacious and very clean with a recently refurbished kitchen and comfortable seating. The owners who met us on arrival were charming and presented us with a tray of delicious cakes. Would like to come back. 5 minutes walk to the closest beach. Just 30 meters away from the flat there is the Recanati bus station with frequent trips from and to principal locations such as Catania Fontanarossa airport (nearest airport), Taormina center, Etna, Messina, Siracusa, Aeolian islands. Although a car is not necessary, many local scooter and car rentals (Avis, Europcar, Autoeuropa, etc) are located in the vicinity. Upon request, direct transfers may be also arranged. There are two small supermarkets within 100 meters walk and a shopping center 1.5 km away ("I Gabbiani"). In the area there are a lot of pizzerias, eating places (on the doorstep "Oasi bar", pub pizzeria "Sire" with Wi-Fi spot and a good value fish restaurant "Sea Sound"). Tennis courts, Spa and Wellness centers nearby. Within 20m distance a "Para-Pharmacy" is also available. In Italy a parapharmacy is a shop selling all the products sold by a pharmacy except those strictly requiring a prescription. Changeover Day: Arrival possible each day of the week depending on availability. Arrival from 6 pm. Departure 10 am; special arrangements possible upon request. Notes on accomodation: The flat can host a maximum of 6 people including children. Cleaning costs are not included in the rent.